Arbuscular mycorrhizal fungi (AMF) play important roles in plant community structure and ecosystem functioning. 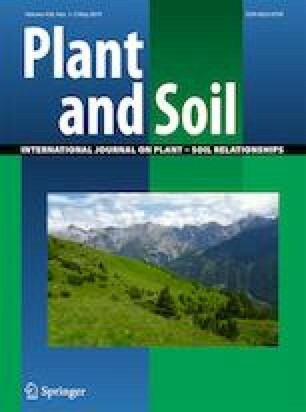 The allelopathic disruption of arbuscular mycorrhizal mutualism is a potentially powerful mechanism by which non-native species can negatively impact native plant diversity. However, there is limited understanding of this mechanism on woody species in forest ecosystems. In this study, we carried out a set of experiments to explore the allelopathy of Eucalyptus urophylla on mycorrhizal mutualists. First, we examined allelopathic effects on the mycorrhizal growth responses of woody species by collecting leachates from the understory of an E. urophylla plantation. Second, we examined if AMF could counteract the allelopathy of E. urophylla by treating the target species with and without aqueous extract of E. urophylla and AMF inoculum. We conducted a third in vitro experiment to characterize the effects of identified putative allelochemicals (IPAs) of E. urophylla on AMF spore germination, namely Glomus mosseae, Claroideoglomus etunicatum and mixed spores extracted from field soil. There was a positive correlation between the stimulatory effects of natural leachates of E. urophylla and the mycorrhizal growth responses of target woody species. AMF could counteract the negative impact of E. urophylla allelopathy at a relatively low concentration. The IPAs of E. urophylla had variable effects on germination of AMF spores, from stimulatory to inhibitory, depending on chemical types and AMF species. Moreover, the AMF G. mosseae was the least sensitive to allelopathic inhibition of E. urophylla IPAs. This study does not support the hypothesis that allelopathy degrades mycorrhizal symbioses. Our study first provides preliminary evidence for a positive correlation between allelopathy and mycorrhizal growth responses and suggests that higher mycorrhizal growth responses could better protect woody species from allelopathic inhibition in E. urophylla plantations. The online version of this article ( https://doi.org/10.1007/s11104-019-04063-4) contains supplementary material, which is available to authorized users. We are grateful to Yan Xie and Lufeng Zhao for their assistance in the experiments. We also thank Shan Luo for valuable suggestions that improved the manuscript. This research was funded by the National Nature Science Foundation of China (key project 31361140363) and the Zhang-Hongda Science Foundation in Sun Yat-sen University.